In most online casinos, those in the United States in particular, the figure on dice rolled cannot be the sole determinant of the outcome in a game of craps, hence most casinos adopt the method of combining playing cards and rolling of dice or sometimes, playing cards alone is used to decide the outcome. Normally, casinos make sure that the odds of the Craps game are just same as other conventional games but as far back as 2009, a newer version of Craps became increasingly popular. This version is known as Play CrapsTM and there have been several issues stemming from the pattern and ways that different casinos offer this version. A good instance is the way the game is run at some California casinos where the operators insist that they use six packs of 54 cards each. This means that a total of 324 cards unlike those in Oklahoma that uses 5 packs of 44 cards stack each. 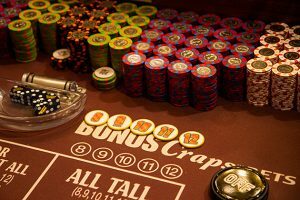 Surprisingly none of the other casinos frequently used by Craps lovers are open to disclosing their pattern or even the number of cards they use. At this point you might be wondering what is in it for either the casino, the player or even this writer but it is the effect of removal that makes the number of cards used very important. Another key factor is that no matter what the first card dealt is, it implies that all the other cards do not have up to 1 in 6 chance of matching the initial card picked. Please note that as it is with dice where a similar chance rate gives you not more than 16.667% possibility of a pair, so is it with the Viejas Crap policy where the matching possibility is 16.409% for the 324 cards. The chance of getting a pair at the Discount Gambling that uses 264 cards is 16.350%. For better understanding, I am going to explain the calculation for both 324 and 264 cards so you have enough information to choose which option you prefer. One thing a player must understand is that when you lay odds on points of 4, 6, 8 and 10, the house edge is usually negative and as such the player has a significant advantage. In some casinos, you are allowed to use about 10X odds to the maximum of about $1000. When a player places his wager on the maximum odds on Points of 4, 6, 8 and 10, then the total house edge between the laying odds and the don’t pass will be 0.016% but if he places his wager on the full odds in favor of all points then the house edge shrinks to 0.011%. The above calculations are based on every throw determined by two random cards from the entire 264-card rack. It must also be noted that the game uses a shuffler each time a card is about to be selected from the shoe. The shufflers are able to aid this strategy using shelves which ensures that new cards coming into the deck cannot make their way into the top layer where new cards are selected from. Hence, until a new shelf is reached, the level of penetration is usually more than only two cards but on the average, even a little penetration is bound to favor the don’t pass bet. This is because a set of cards used to get to a point on the come out roll is not likely to be used again until all the old shelves are empty and a new shelve is hit. It is therefore very unlikely to attain a seven which guarantees a win. There are various sites that run analysis on how the shuffler affects the player’s advantage which is usually a 1.8% for every don’t pass line wager that a player makes. The analysis then introduces some card counting strategy to bolster the player’s chances of winning. 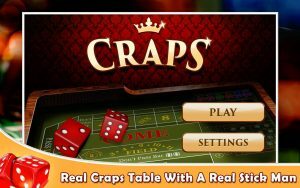 It is important to note that there are other numbers of decks available in the games of Craps. Some casinos have been reported to use eight decks of cards but only using the aces to sixes. Six cards are dealt face down and the player is directed to select two cards which simulate the roll of dice. This is a set of crap side bets that involves the player rolling a given number for a certain number of times before getting a seven. When a player rolls bets on 2 to 6, he must roll that total for the same number of times as the total figure itself. A good example is when a player places a wager on the number 5, he must roll 5 times getting a total of five in each roll before he reaches a seven. However, for totals of 8 to 12, the player will roll the total of 14 less of what the entire total is. Another example is when a player attains a total of 11, he must then roll 3 times before a seven. The formula is 14-11 = 3.